The Holy Father’s resignation is a selfless and noble act done for the good of the church that he has loved and served for decades. The resignation, announced this morning and set to take effect on Feb. 28, while surprising to almost everyone, is not completely unprecedented. Several popes have resigned, including Gregory XII in the 15th century, in the midst of the Western schism; and, most famously, Celestine V who was "litterarily" consigned to hell in Dante’s Inferno for his resignation in 1294. More recently, there had been speculation around the time of Blessed John Paul’s declining health as a result of his Parkinson’s disease, but John Paul opted to continue in his job, providing a sign of human suffering for all to witness. The pope is old and sick, John Paul would say frequently, but his suffering is part of the human condition. For me, it was a moving testimony to John Paul’s desire to serve even during a time of struggles. The pope’s dramatic resignation seemed to shock many in the Vatican, including the papal spokesman, Federico Lombardi, SJ. “The pope took us by surprise,” he said. To find a similarly surprising event one can look to Pope John XXIII, who served as pope between 1958 and 1963. John XIII caught the Vatican, and his cardinals, by complete surprise when he announced the convening of the Second Vatican Council, which he said, came upon him after much deliberation, but rather, as he said, something that “came forth like the flower of an unexpected spring.” For all the bureaucracy in the Vatican, the pope is still his own man. In the past year or so there has been increased speculation as to Benedict’s ability to do his job, and carry it out the way that he would like to. Trips have been curtailed and shortened on various occasions, and even his appearances in the Vatican have included his moving around on portable devices, as an aid his walking. Like anyone of his advanced age, he had to ask himself whether or not he could do the job. Thus, Pope Benedict XVI and Pope John Paul II reached entirely different conclusions to the same question: Should an ailing pope resign? For John Paul, the image of the suffering, sick pope was of spiritual value to his flock; for Benedict, the job needed to be done. Discernment is always very personal; and it is important to see how two holy men reached two entirely different decisions. God speaks differently to different people facing the same question. In the lives of the saints, for example, we often see how the same situation is handled differently by different saints. When St. Francis of Assisi was facing a painful malady of the eyes, brought on, doctors thought, by excessive tears during Mass, St. Francis decided that he would continue as he had with attending Mass. When St. Ignatius faced similar problems with his eyes, the physicians warned him, he decided to curtail his devotions, in order to have sufficient health to do his work. Both were responding to what they felt were God’s promptings in their lives. The pope also shows great spiritual freedom in his resignation, what St. Ignatius calls a freedom from "disordered attachments." Rare is the person today who can relinquish such power, voluntarily. Pope Benedict XVI may likely remembered as a pope who in his relatively short pontificate, sought primarily to strengthen the orthodoxy of the church in a variety of means, who authored several important encyclicals, notable for their theological depth and appeal, and who continued a full set of public appearances, and who, despite his full schedule, published three well-received books on the life of Jesus. Never the media superstar that his predecessor was, Pope Benedict XVI, a lifelong scholar, exuded his own brand of charisma, which came from his profound theological acumen and his personal relationship with Jesus. Perhaps his most often neglected talent was his series of superb Angelus messages, delivered every Sunday during his public appearances in St. Peter’s square. His most lasting legacy, I would suggest, will not be in the various “newsworthy” acts of his papacy that were highlighted in the media so often (his long negotiations with the breakaway Society of St. Pius X, his strong actions against the sexual abuse accusations made against the powerful founder of the Legion of Christ, the revised English translation of the Mass, his own response to the sexual abuse crisis, or the controversy over the comments that angered the Muslims, and so on) but something far more personal: his books on Jesus. Far more people will most likely read those moving testaments to the person who is at the center of his life—Jesus of Nazareth—than may read all of his encyclicals combined. Others may disagree about this aspect of his pontificate, but in these books, the pope brought to bear decades of scholarship and prayer to the most important question that a Christian can ask: Who is Jesus? This is the pope’s primary job--to introduce people to Jesus--and Pope Benedict did that exceedingly well. Thank you for this lovely column, Fr. Martin. I received Pope Benedict's Infancy Narratives book on Christmas morning and was able to finish it the same day. In the words, one could sense the humble yet scholarly wisdom of this great man - no doubt (to me) a future saint. Fr. Martin: Your comments are accurate and substantive and certainly reflect a perspective that all who love the Church should remember. There can be no doubt that the demands on any successor to St. Peter are immense, regardless of the times in which he is called to this ministry. That said, I daresay your words are also quite kind, perhaps overly so. I pray that history is kind to Benedict, though time will tell what his lasting legacy will be. As a gay man (ordained priest in 1987), I cannot help but think of His Holiness without also remembering with great pain the way in which he has marginalized God's LGBT sons and daughters. His pursuit of a smaller, holier Church can and should be challenged regarding its faithfulness to fundamental Gospel values and Jesus' example of welcome and inclusion. To speak of a significant portion of God's sons and daughters as "intrinsically disordered" flies in the face of our belief that we are all created in the image and likeness of God. Again, I thank you for your words and for challenging us all to see His Holiness as the man he is. May God bless him in his retirement, and you in your continued ministry. Fr. Timothy---all due respect, but I certainly do not think of YOU as "intrinsically disordered." The Church is speaking about an objective disorder not about a subjective evil for which anyone is personally responsible. I was born with an inguinal hernia. That was an objective disorder. But I'm certainly not an intrinsically disordered person. Why is homosexuality, in light of the purposeful design of human beings, not the same thing? Aren't the most difficult issues that the LGBT community wants more related to the exercise of their sexuality rather than the fact they are homosexual or bisexual? Certainly every other LGBT issue can--and should--be reconciled to Church teaching. ...or rather, let me say, Church teaching should be reconciled to every other LGBT issue. Thoughtful article which accurately points out the scholarly qualities of this Pope, and his deep love for the Church as he understand/understood it. It is revealing in the article the different decisions made by Saints and Popes facing similar conditions. The uniqueness of each human being reflects how God guides each conscience through his/her own path when discerning and making serious life decision. 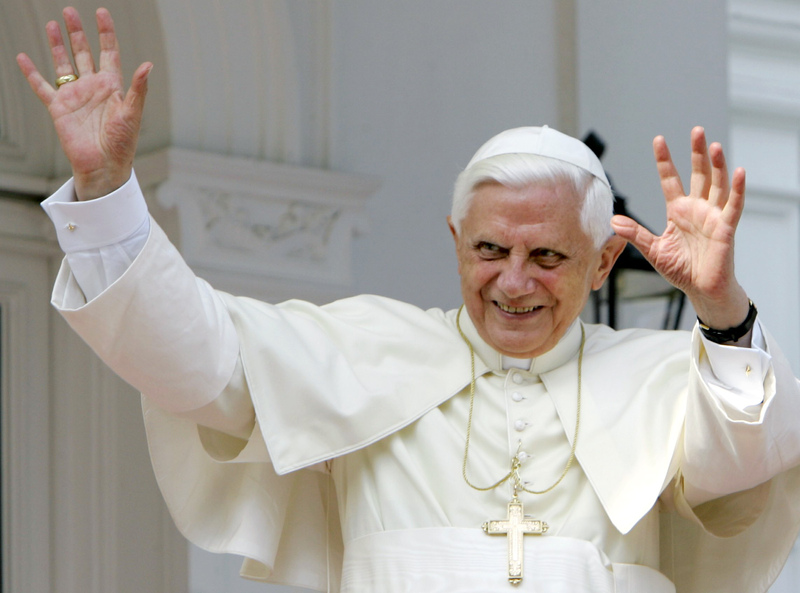 Benedict XVI historic resignation shows the Spirit leading the Church. The mystery of the future is just that, the mystery of God's plan. Let's be grateful for the pope's service done with dedication and zeal. Let's hope and pray that a new Pontiff may be enlightened by the Spirit in this modern and complex world, where the Church is facing deep theological and ecclesial divisions within. May the renewed evangelization be pastoral and inclusive. Just two brief comments on the side. First, I wonder if the nature of Parkinson's (in addition to JPII's perspective and choice about how to fulfill the Petrine Ministry) had something to do with it. If JPII had chosen to resign, it may have opened a troubling sidetrack about whether he was of sound mind to do so. The other comment is that I am curious about the phrase "bark of St. Peter." Is this in reference to the imagery of a tree as "Jesus is the vine and we are the branches" or is it more like "barca" as in the "Boat of St. Peter." I imagine it is the former, but I find the "Boat of St. Peter" much more full of spiritual insight in light of the recent scripture readings, the call of St. Peter and his own imperfect Apostolicity, and his touching reconciliation with the Risen Lord where he lept from his boat to have breakfast with the Stranger on the shore. I, too, wondered about the phrase "bark of St. Peter". Agree with you re: barca as in the "Boat of St. Peter" offering more spiritual insight in light of recent scripture readings at Mass. Thanks for bringing this up! The Christocentric depth, beauty and deep spirituality of the pope's theological writing continues to take my breath away and has been instrumental in opening a door to Jesus, so long blocked for me. I had not expected it. Reading his original work, became prayer and encounter with the " author of life " this pope unfailingly loves. Thanks for this beautiful commentary. My first thought when I heard he was resigning was also that his Jesus of Nazareth books would be one of his greatest legacies. Thanks for this wonderful tribute to Pope Benedict on this historic day! An excellent article about a great scholar and pope. I don’t have much to say, yet would like to add a few words. Thanks for the laugh, Fr. Jim, "For all the bureaucracy in the Vatican, the pope is still his own man." Perhaps bureaucracy is something we all can reflect on while asking, “Who is Jesus?” Thanks. I appreciate the way Fr. Martin has looked deeply into the many facets of the Pope's life. Still, the "profound theological acumen" and the paeans to his intellect on this website and elsewhere should not mask the fact that he diminished the intellectual life of the Church. He may have introduced people to Jesus in his well-crafted books but his actions speak louder and they fell far short. How interesting that there is no mention of what many Catholics will most remember about his papacy - his total and absolute failure to not hold a single bishop accountable for enabling child abuse and protecting the abusers. Instead, he often promoted bishops who were involved in protecting criminal priests. I agree with Fr. Martin on the value of the intellectual legacy of Benedict XVI. His "Introduction to Christianity" , written in 1967, is one of the most captivating books I have read about the Catholic faith. It was written by Joseph Ratzinger, then an influencial theologian of the Second Vatican Council. I highly recommend it. Thank you for the reflection.